Do you find it difficult to sit in silence, in meditation? Yoga Nidra is a form of guided meditation and is an excellent way to help keep the mind focused on the present moment. You can use the Yoga Nidra techniques on your own, or in addition to the practice of sitting in the quiet of silent meditation. 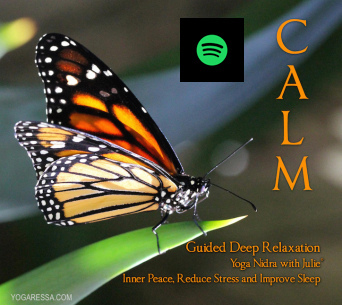 CALM — relieve stress and connect with a sense of inner peace. Includes breathing and visualization techniques to create inner harmony. Promotes deep rest in the body, and encourages personal transformation through the use of affirmations. FLOAT and RELAX — guided meditation to add to the bliss of a floatation tank. Yoga Nidra is an obvious and excellent match for the floatation tank. Hearing the soothing Yoga Nidra meditation can help you to relax more deeply into the full experience of the floating. It’s been incredibly rewarding and inspiring to receive feedback on how the Yoga Nidra “CALM” album has brought ease to so many people. Thank you for letting me be a small part of that. May the “PURPOSE” album be an equally meaningful experience. — Julie. 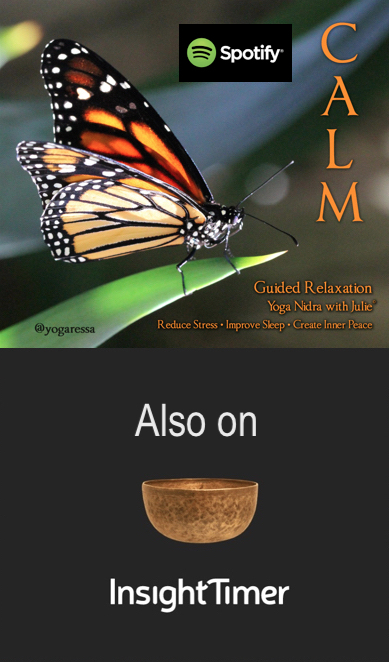 This Yoga Nidra meditation album (download or Audio CD) includes breathing and visualization techniques to create inner harmony. It promotes deep rest in the body, and encourages personal transformation through the use of affirmations. Click on the video above to hear recording samples. Give your mind a break from its constant internal dialogue, jumping from one thought to the next. Ease the restless mind, reduce stress and experience improved sleep. Feel empowered to make your dreams and aspirations a reality. Read more info in this Yoga Nidra article. Yoga Nidra is accessible and beneficial to beginners as well as experienced practitioners — all you need is a willingness to lie still and listen to the guided meditation. The practice of Yoga Nidra is typically done lying on your back, making sure you feel comfortable, with the support of cushions or blankets, as needed. You may also be seated in a chair, if this is more comfortable for you. Think of how you typically feel during those moments just before you fall asleep, not quite awake and yet not quite sleeping. The state of Yoga Nidra feels similar, as you remain awake and calm and listen to the guided meditation on this CD. You’ll hear verbal cues to become aware of different parts of your body, to imagine sensations within your body and to visualize images. These techniques, coupled with breathing awareness, prepare your mind to be receptive to hearing and accepting positive statements. Here, you will state your intention (or sankalpa, in Sanskrit) of how you would like your life to be — good health, a calm and peaceful mind, confidence and success, patience, a change in your relationships — whatever your heartfelt desire is. This is how Yoga Nidra can truly become a gateway to transformation. If you are buying the physical CD, you can also enjoy the photographs of the monarch butterfly which I watched emerging from its chrysalis in our garden. The photographs capture some of the magic I experienced as I witnessed the marvel and mystery of nature unfold in front of me. An hour of Yoga Nidra is believed to be the equivalent of four hours of typical sleep! I wish you calm, contentment, and meaning in your life, through the practice of Yoga Nidra. Namaste.